Madison’s food bloggers write regularly about their recent obsessions, favorite recipes and restaurants. 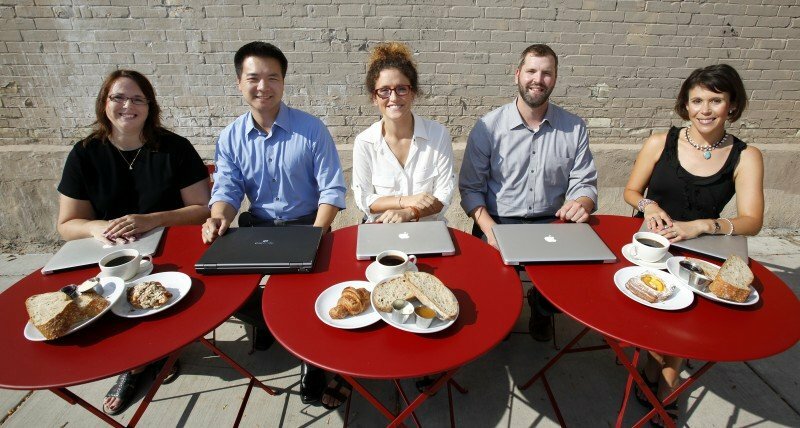 They include, from left, Jeanne Carpenter (Cheese Underground), Brian Lee (Eat Drink Madison), Holly Whittlef (The Healthy Everythingtarian), Nick Brown (MadTable) and Kimberly Aime (Badger Girl Learns to Cook). Megan Hile Block started her blog, Foodalution, intending to improve her eating habits. For Leslie Damaso, the blog she started with Keith Burrows was born of a mutual love of Mineral Point. Driftless Appetite is a celebration of southwest Wisconsin — the land, the food, the art and the people. Writer Kimberly Aime went through a series of blog names: Badger Girl in London, Adventures of Badger Girl and Badger Girl Back Home. Now she writes about recipes, restaurants and farmers’ market finds at Badger Girl Learns to Cook (learntocookbadgergirl.com). In early 2010, she began writing about healing Indian cuisine, green smoothies, flaxseed and dandelion juice. But despite (or in addition to) her virtuous intentions, Block still loved cakes and sweets. One pivotal batch of caramels covered in chocolate and sprinkled with sea salt changed everything. For Block, a bilingual secretary for the Verona Area School District, writing a blog has transformed her creative and professional life. She is now developing a sweets business, taking cake and chocolate orders from her home, and talking with Underground Food Collective about a potential partnership. Block is one of dozens of people, many in their late 20s and early 30s, who are writing about and photographing their food in Madison and the surrounding area. For a city of a few hundred thousand, the local food blogging scene is impressively active and varied. There are restaurant review blogs, like Eat Drink Madison and Isthmus critic Kyle Nabilcy’s Irony or Mayo. There are blogs devoted to local fish fries, food carts and beer. There are blogs that hinge on sustainability and food advocacy, like The Conscientious Omnivore and All Hail Honeybees. Some take a farmers’ market focus, like Driftless Appetite, or aim at those with dietary restrictions, like Farmers Market Vegan and the (mostly) dairy-free Badger Girl Learns to Cook. Despite this vigorous activity, food bloggers rarely know each other in real life. Perhaps unexpectedly for such a convivial subject, food writing can be isolating. Some will meet for the first time at an upcoming food writers’ panel on Thursday, Sept. 27, at the Sequoya branch of the Madison Public Library. “I am always discovering people in Madison who have blogs,” said Holly Whittlef, who recently redesigned her blog, The Healthy Everythingtarian. Whittlef has fashioned herself as a kind of blogging network hub, bringing together a few local bloggers for Restaurant Week meals and Eat for Equity dinners, a recurring fundraiser for local food causes (like offering free CSA vegetable boxes to families in need). Most bloggers start with that most basic of writerly impulses: They have something to say, and they need somewhere to say it. “We started at the farmers’ market,” Damaso said. “We really enjoyed the people we talked to. That led to getting to know more wonderful people in the area, the producers, the farmers, the artisan cheesemakers. “One thing I love about this place is that people care so much about good food and local food, local everything really,” she added. Kyle Nabilcy started his blog, Irony or Mayo, in 2005 with “almost entirely political ranting.” He posted a little about food the next year, increasing in frequency until he landed a freelance gig writing about food for Isthmus in 2007. For other writers, blogging is a path, intentional or not, to self-improvement. Kelly Nigl of the blog Brownies and Zucchini is a self-proclaimed picky eater. In 2010, she and her husband were stuck in a rut when they ate out — always the same places, the same dishes, over and over again. Writing about restaurants has opened her eyes to dishes like Pad Thai and the difference in local fish fries. She still doesn’t like beer, bacon, peanut butter, asparagus or anything remotely spicy. But she cooks fish occasionally at home now, and she consistently pushes herself to try new things. For JM Rasmus, co-founder of Eating in Madison A to Z, his pickiness led to the launch of the blog in 2004. His wife, Nichole Fromm, loved to eat, and as she paged through a dining guide, the idea to eat at every single restaurant struck Rasmus as the best way to make her happy. For eight years, Rasmus and Fromm systematically ate at nearly 800 restaurants in the Madison area, and Rasmus’ palate expanded by inches. “For Nichole it was more about being able to rank which ones were the best,” Rasmus said. “Being able to say, when I want Southeast Asian, I’m going to go to Ha Long Bay, for example. Their writing has improved, too. Eating in Madison A to Z is probably the longest-running, most consistent food blog in the city. It has become a touchstone for restaurant lovers and a networking tool for those who follow the local restaurant scene. “You don’t start with community,” Rasmus said. “You find it by doing the work. If someone engages with your writing, then you engage with them. You start as a lone voice talking to no one … and the best way is, go write comments. Then you’re part of their conversation and they will be a part of yours. Blogging, for most people, is not a good way to make money. Even sites with reasonably consistent traffic don’t make much. “I make some money from my ad network, but it’s enough to get a meal or two per month,” said Whittlef at The Healthy Everythingtarian. Yet as newspapers shrink and crowd-sourced sites like Yelp, Urbanspoon and Chowhound move in where established critics once reigned, food bloggers gain credibility as well as numbers. In 2009, the Federal Trade Commission ruled that bloggers must disclose when they write about products they’ve received for free, a nod to the increased sway of popular online writers. Headlines from the past few years report food blog “explosions” in Boston, Philadelphia and Houston; BlogHer, a blogging conference for women, sold out its first food-focused conference in fall 2009. Locally, two new blogs launched in April — You Need to Eat This, which primarily reviews restaurants, and MadTable, a food news site updated five days a week with fresh content. Nick Brown modeled the latter off another site he started, Daily Coffee News. With a background in magazines and newspapers, Brown is an entrepreneur with skills in writing, photography and advertising. When the site launched, “it got really good feedback right away,” said Brown, who posts every weekday on restaurant openings, food events and the latest craft brew. MadTable is a unique model locally. Brown provides all editorial content. The site has ads from local restaurants and food businesses, and a sidebar of food-related jobs culled from Craigslist. He hopes it will “grow organically” in content in scope, and would eventually like to add contributors. Brian Lee, founder of Eat Drink Madison (2008) and Revelation PR (2011), sees his blog as a way to establish himself as a restaurant expert. Jeanne Carpenter’s background in journalism has led her to strict rules about freebies (she doesn’t take them) and helps her indulge her love of a good scoop (“there’s nothing I like more”). “A blog is the perfect combination of PR and journalism,” Carpenter said. “You get to write about what you want and say whatever you want. Many local food bloggers move on a spectrum between the passion of Driftless Appetite and the all-business approach of MadTable. Kimberly Aime, the energetic cook and journalist behind Badger Girl Learns to Cook, has found a new career through her blog. Her background is in theater history, literature and criticism, but when she decided to leave academia, food writing slowly came to the fore. A blog profile of Patrick O’Halloran, the chef at Lombardino’s, led to a cookbook collaboration (tentative release is fall 2013) with O’Halloran and general manager Michael Banas. She will teach two classes at Orange Tree Imports this fall, on making the most of a CSA share on Wednesday, Sept. 26, and easy holiday entertaining on Wednesday, Nov. 7. Writing a blog may not, by itself, make money enough to live on. But “it allows any writer to put together a nice portfolio of work,” Aime said. Amy Verhey, a journalism senior at the University of Wisconsin-Madison, would quickly agree. Her blog, All Hail Honeybees, started as a series of restaurant reviews and has morphed into a platform for her food advocacy. Verhey has expanded from food blogging to working in the industry, at the Baker’s Window on State Street and Nostrano on the Square, as well as the Slow Food UW cafe during the school year. She’s also become a frequent user of sites like Twitter and Facebook. For Block, focusing the blog on cakes, pastries and fine chocolates has meant pursuing a new kind of education. This summer she spent five weeks in Ecuador, watching chocolate being made from bean to bar, and she hopes to do a short internship in France in summer 2013. As she moves forward, the blog that started it all — Foodalution — will change when she chooses a new name for her chocolate business. The Madison area is home to at least two dozen active food bloggers. Here are a few of them. Below are some of the most active food blogs in the Madison area. This is not a comprehensive list. Madison Public Library Sequoya Branch, 4340 Tokay Blvd. Thursday, Sept. 27, 7-8:30 p.m.
Over 8 years, couple tried 779 eateries and graded them all.